Since Erica doesn’t eat pork chops (Justin here writing this post), I sometimes get a craving for pork chops and have to make up some for myself. Usually I just do a simple seasoning and cook them on the grill or cast iron pan, but this time I decided to try them in the instant pot. 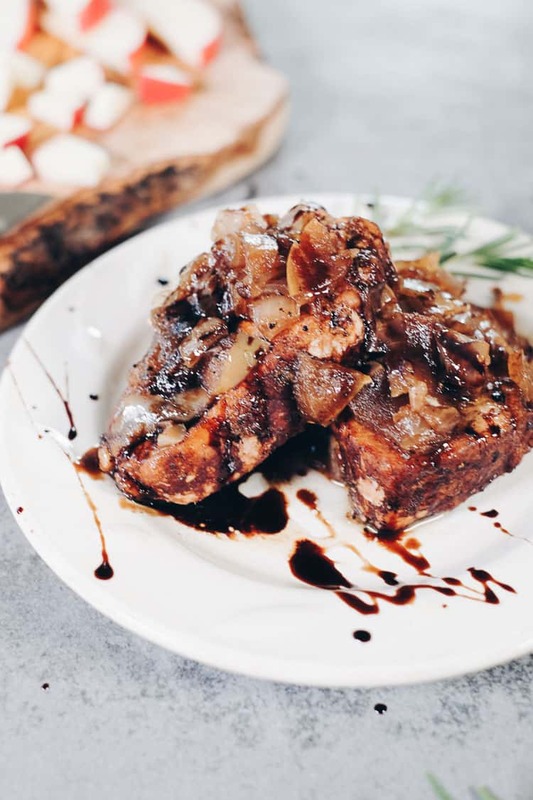 Boy was I happy with how these instant pot pork chops with apple balsamic topping turned out! Have you used your instant pot to sauté anything yet? When we first got ours, we only used it for soups and roasts and things you’d typically make in the crockpot. But the instant pot has so much more to offer, why not use it for other recipes? The sauté function on the instant pot is easy, and it’s basically like cooking something in a skillet over medium heat. 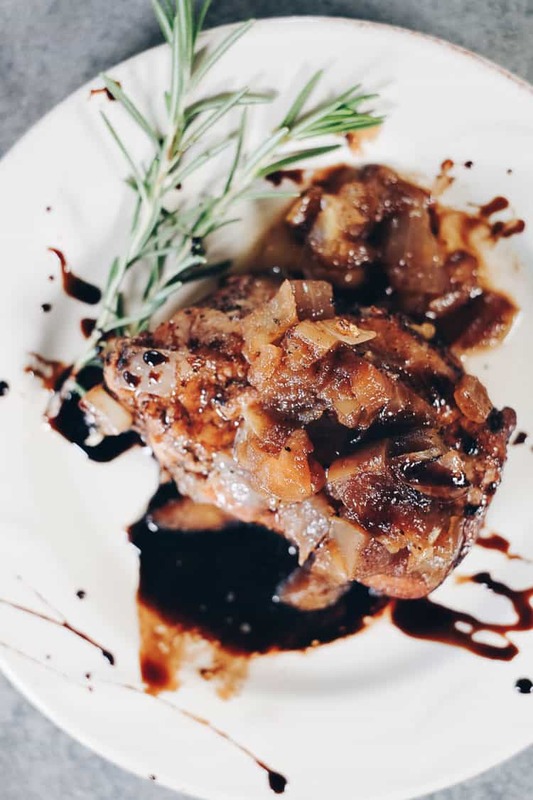 So, for this instant pot pork chop recipe you can use the instant pot for both browning the pork chops and cooking them with a delicious apple balsamic topping. Win win. Pork and apples pair perfectly together. There’s something about the sweetness of the apple that creates a perfect combination of flavors. For this recipe, I added some light seasonings, onion and tart balsamic to bring even more flavor to the topping. If you are looking for a simple recipe, this is about as easy as it gets. 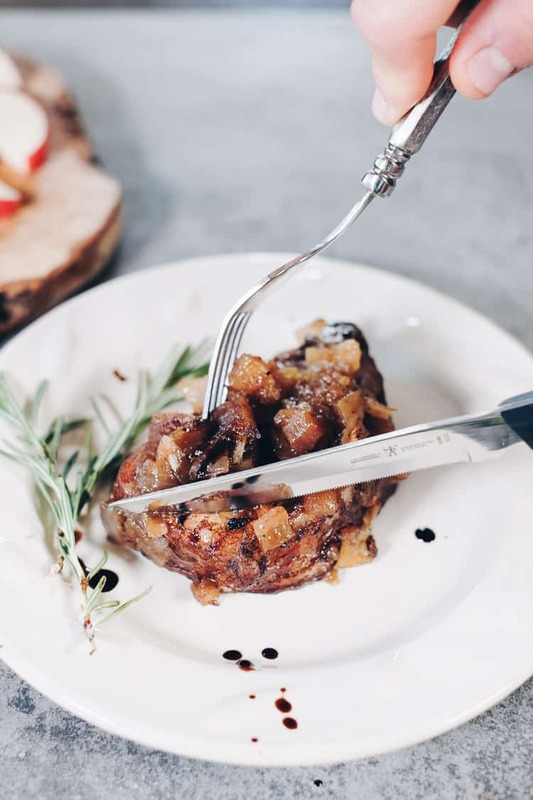 The hardest part in making these instant pot pork chops is cutting up an apple and an onion, that’s really all there is to it. Then, just sauté the pork chops for a couple of minutes to brown the outside, add the remaining ingredients and just sit back and let the instant pot work its magic! Looking For More Whole30 Instant Pot Recipes? In case you haven’t seen it, we put together a round up post of 21 Whole30 Instant Pot Recipes. Be sure to check this post out and pin it for later so you always have plenty of instant pot recipes on hand. Get your instant pot out and go make these pork chops! 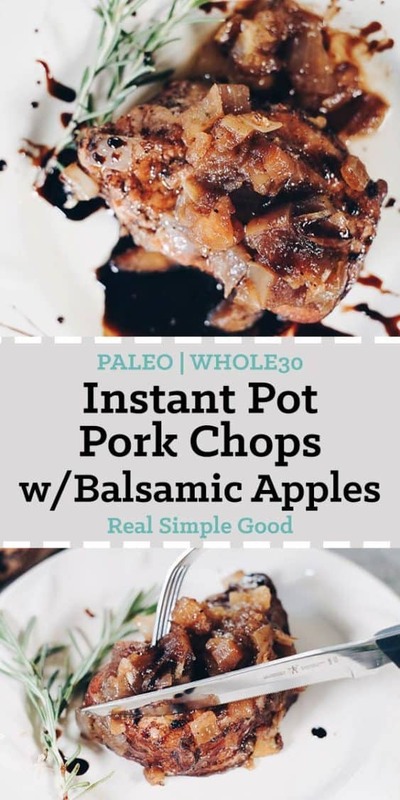 You will love the flavor combo of apple, balsamic and pork and it’s such a simple and easy recipe. Let us know how it goes by leaving a comment below. Also, take a photo and tag us on Instagram @realsimplegood, so we can check it out! 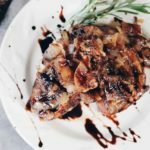 Easy, 6 ingredient instant pot pork chops with apple balsamic topping. This is a simple Paleo and Whole30 recipe that the whole family will love! Chop onion and apples as noted and have the other ingredients on hand for quick access. Turn your Instant Pot on and set it to “Saute”. Add in ghee to melt and stir it around to cover the bottom of the pot. Place pork chops in the instant pot to brown each side (about 1-2 minutes per side). Don't saute too long, it's just to get a quick brown sear on each side. Once the chops are browned press the “Keep Warm/Cancel” button. Sprinkle the onion and apples over the pork chops. Drizzle on the balsamic vinegar over the top. Sprinkle the garlic powder, salt and pepper over everything. Lock the Instant pot lid into place and close the pressure valve. Cook on the manual setting for 10 minutes. Quick release the pressure once the cooking is complete. Remove the pork chops and spread the apple/onion topping evenly over each pork chop for serving. Let us know how it goes, I’m sure it will turn out great! If we tried them again. It’s a bummer too because the topping was yummy! Try natural release instead of quick release for the first 15 minutes or so. This lets the meat rest and generally help meat retain moisture. Made this today from sliced pork loin… so yummy and not dry at all. I want to make this but I have 5 thin boneless chops already. Thoughts on cooking times for that? Thanks! I would just give them a very quick sear on each side and then pressure cook for 7-8 minutes instead of 10. Just be sure to check them and make sure they are cooked before eating (you can always saute them a little more if needed). Let us know how they turn out! Hi! I made this last night and my 1 1/2 inch boneless pork chops came out dry. I put my instant pot on “pressure cook” for 10 minutes and then let it slow release. My pot gives me the option for “low” or “high” pressure when I use that function. I selected “high”. My IP is new to me, and I would appreciate any advice you could give me. The sauce was delicious and I would certainly make this again, if I could figure out how to not dry out the chops! Hi there – Our instructions say to quick release the pressure, so your pork chops actually cooked for an additional 15 minutes or so by letting the IP naturally release. Next time try the quick release and also only do a very short sear on both sides using the saute function. Let us know how it goes! Having cooked with a pressure cooker for many years, I recommend a shorter cooking time, about half, with a slow release. I want to try these tonight. Doesn’t there need to be any liquid in the pot? Followed directions above excepted did a 10 min NPR at the end. Turned out moist and had lots of yummy juices with the apple onion mixture. Will definitely make these again. Have you done this with frozen chops? How would you do it? Sorry, we haven’t tried this with frozen chops and I’m not sure how they would turn out. This is my go to pork chop recipe for the instant pot!! Can I substitute red wine vinegar for balsamic? Yes, it will just have a different flavor profile and might create a thinner sauce. Let us know how it goes if you try it out! I was looking for a fast and easy meal, and this definitely delivered. I used some thick sliced bone-in, and some thick slice boneless. They were both good, but the bone in was AMAZING. I could break it apart with my fingers for the baby, but it still maintained the crispy exterior. I have had a problem over cooking meats, so I did 5 mins with NPR on mine. Also, I tried doubling it with great results, except I should probably not have doubled the balsamic. There was entirely too much liquid, but I don’t know how different the flavor would have wound up without the extra balsamic. Could I make a double batch all at once? Would I need to change the cooking time? We haven’t tried this, but if you’re able to sear all of the pork chops first you should be able to use the same cooking time. Just check the pork chops when you finish to be sure they are cooked to your liking. Just wanted to say that this recipe is wonderful! It is by far mine and my husband’s favorite pork chop recipe. We use thin pork chops and the meat just falls right off the bone. And it’s so simple to make. I know this review sounds cliche, but I’m really pleased with how this meal turned out. Thanks so much for the review, we are so glad you enjoy the recipe! Any suggestions on using a crockpot instead of an instant pot for this recipe? We haven’t done this recipe specifically in the crockpot but we have done other recipes. For this, I’d recommend giving the pork chops a quick sear for 1-2 minutes on both sides in a pan. Then, transfer to the crockpot and follow steps 6-7 in the recipe. Cook on high for 1.5 to 2 hours, depending on the thickness of the chops. Hopefully this helps and let us know how it goes! OMG, it’s DELICIOUS! 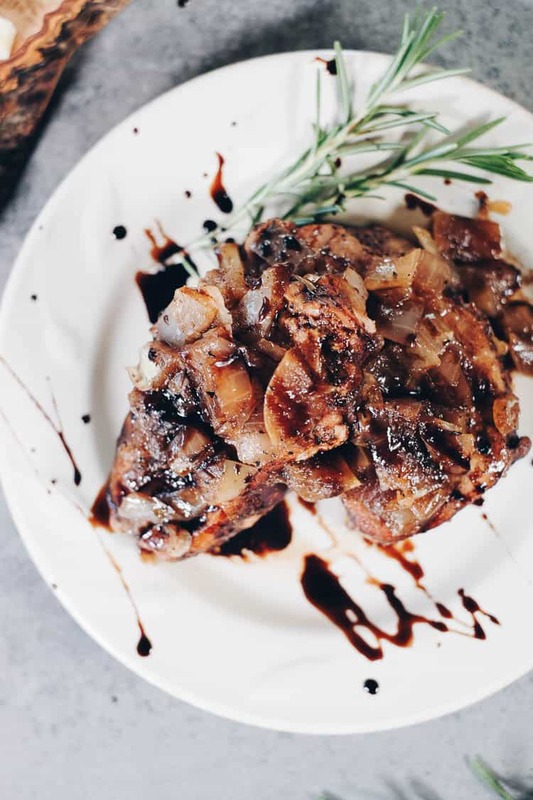 I was worried it would be dry because the recipe didn’t call for any liquid other than the balsamic to be added and I was SO wrong- the pork is incredibly juicy and the onion and apple created a heavenly flavor and are the PERFECT consistency! Thank you. Oh, and I followed your crockpot suggestion and you were right on. Making it for the 3rd time since finding this recipe this summer. For us we love the sauce, but tweaked it a little or maybe a lot. 😉 LOL. . We doubled the amount of apples and cut back the vinegar and garlic powder by half and for u, love it that way! The sauce is great over rice as well as the pork chops. 🙂 Thank you for sharing this recipe. Now to move on and try some over your other ones. Having an instant pot has been a real energy saver at our house over this hot summer. Saves us from using the oven but at the same time allows us to have those meals that we love having but not wanting to use the oven. That’s great! Glad you found the recipe and modified it to your liking :). Meat was bit tough, flavor was just ok. Thanks for your recipe. Sorry this didn’t turn out as desired. I really enjoyed the flavor of this recipe. I used two apples as mine were pretty small. I did get the “burn” message on my insta pot. I had to add some beef broth and a little more vinegar to get more liquid. I also went down to 9 minutes. Will definitely make this again. Glad you were able to adjust and make it work! Thanks for trying our recipe and coming back to tell us how it went :). Really, really great flavor, but chops were WAY over cooked and I only cooked them for 7 minutes. Next time I will try cooking them for only 4-5 minutes with 10 NPR. Glad you liked the flavor and hopefully next time you get the chops cooked to your liking. That was very tasty, thanks. And I don’t even use salt! I had thick pork chops and did 8 min HP with 10 min NR – could have pulled em out sooner! The apples were Anastasia. We tried this tonight, it turned out amazing, perfect tender pork chops, and the sauce was delicious! I tripled the sauce, and wonder if that’s why my chops turned out so moist, and tender? That’s great to hear! I’ve never tripled the recipe, so I’m not sure. Glad to hear it turned out well :). Can I cook potatoes at the same time in a dish above my 4 pork chops?? We’ve never tried that and I’d be worried about the potatoes getting cooked with such a short cooking time. You’d definitely want to cut the potatoes up into small chunks if you tried that. Let us know how it goes if you do! Outstanding! Simple, quick, delicious. What more can you ask for? Family loved it.Will absolutely make again. What kind of onion and apple do you recommend? Just a regular yellow onion and any crisp apple will work!